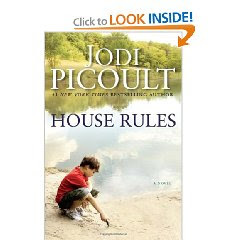 One of the best things about reading Jodi Picoult is that she's so consistent. You always know what you're going to get whenever you read any of her works: the family drama (usually involving a fiercely devoted mother, an ignored sibling and some poor child with a disability or medical problem), the lawyer-with-a-heart-of-gold character, a tense courtroom scene and some contemporary references sprinkled here and there. And while some might say that "consistency" is just a nice way of saying "formulaic," I would argue that there is something quite comforting in being able to rely on a decent reading experience. This time around, Picoult focuses on her attention on Aspergers Syndrome, which occurs on the low end of the autism spectrum. Jacob Hunt is an 18 year old kid trying to fit in with everyone else. His social skills teacher, Jess, encourages him to ask girls out, make normal conversation and eye contact and attempt to empathize with others. His mother, Emma, is his biggest champion. However, one day Jess goes missing and is eventually found dead. Whats worse is that Jacob, who is an avid CSI fan and forensic science hobbyist, might have played a part in this grisly case. The scary thing is that because of the Aspergers, Jacob exhibits symptoms similar to psychopaths and serial killers. As usual, I enjoyed this book, though I was definitely able to figure out the ending long before it actually arrived. The dialogue is a little cheesy, as usual. The most interesting part though, I found, was the portrayal of Jacob. Having known several individuals with Aspergers, it was very enlightening to see things from his point of view as well as having to see what his mother had to deal with on a daily basis.